2. Process (Programs, Tools, Skills, FOCUS principles): For the logo I used I wanted it to be simple and easy to recognize so I went with the letters that are back to back with the line and small text. Then for the Business card I added the Lines to make it more interesting. Then for the letter head I broke up the design and used it throughout the design. 1. Description: I created a business card and letter head for an imaginary public relations firm named after myself. 2. Process (Programs, Tools, Skills, FOCUS principles): For the first logo I created an ellipses and then copied it and placed it in front of the first. Then I moves it to the left and up and gave them each a stroke and a different fill. Then I Placed the letters KB in the center of the top ellipses and changed the color and created outlines of them and moved them closer together. For the second logo I created I used the brush tool and changed the style of the brush to look more like a paintbrush. Then I created the design with the two curved lines crossed with the straight lines. Then I took the opacity down to about 20%. Then I created the letters KB and changed the colors and placed them on top of the line design. Then I typed the words “Public Relations agency underneath and changed the font to compliment the letters. For the last logo I typed the Letters KB and then mirrored the letter K and moved it so that both letters shared the same stem. Then I placed the black line underneath and put the words Public relations Agency underneath. For the letter head I took apart the last logo I made and used each element on different parts of the letter. 3. Message: The message I want to convey with my logo is professional and simple so that it is easy to recognize and recreate. 5. Top Thing Learned: Logos do not need to have a lot of color or detail. It should be simple enough to distinguish and bold enough to recognize. 2. Process (Programs, Tools, Skills, FOCUS principles): First I placed the picture of the girl sitting on the wall and put a mask on it. Then I placed the picture of the sky with the clouds in a layer and moved it behind. Then I took a medium sized brush on the layer mask and revealed only the girl, the wall, and some of the landscape to be able to blend with the sky to make the space in the picture appear more open. Then I added a gaushen blur to the background layer to make it match the other picture. 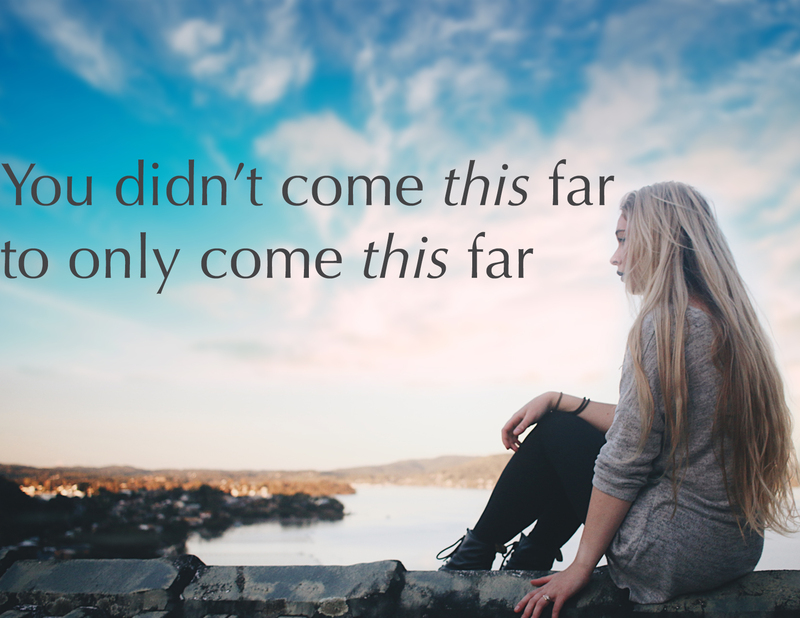 Then I added another layer and placed a text box with the words “You didn’t come this far to only come this far” and then changed the font to emphasize the word “this” both times. I then changed the color and justified it left.